Inspired peices of world famous jewelry worn by legendary icons such as Marilyn Monroe, Audrey Hepburn, Vivien Leigh and many more. Marilyn’s platinum and diamond eternity band, given to her by Joe DiMaggio after their 1954 wedding, was set with 35-baguette diamonds. It sold for $772,500 to an anonymous bidder, and was missing one stone at the time of auction. Marilyn owned a bevy of fine jewels and statement pieces. The reality, however, is that most of Marilyn’s personal jewelry collection consisted of costume pieces and jewels on loan. It is known that Marilyn owned two valuable pieces of jewelry; a diamond eternity ring, and a strand of pearls – both gifts from her then-husband Joe DiMaggio. 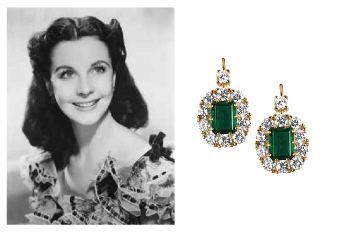 Vivien Ieigh’s famous emerald earings as worn in “Gone With the Wind". Mr. Selznick finds his Scarlett. The shadowy figure stepped forward, green eyes glinting and the flames of Atlanta playing across her face. "David", said the producer's brother, "I want you to meet Scarlett O'Hara". These emerald earrings are as green as Scarlett's flashing eyes and as memorable as Mr. Selznick's film, made using synthetic green emerald earrings 1.03 ct each stone, gold plated sterling silver, surrounded by 10 round cz's.